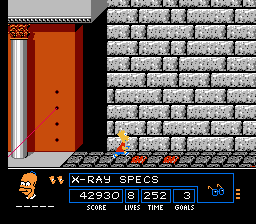 NES The Simpsons: Bart vs. the Space Mutants (USA) in 12:58.9 by Deign. Bart Simpson has discovered that mutants have a machine to enter ingredients which will allow them to conquer the Earth. Bart goes in search of these ingredients to hide them or to take them, avoiding disaster. His adventure will take him across an amusement park, the shopping mall, and the museum, to name a few. This is a very hard game. Its controls are very poor, and the collision detection is very glitchy, making you fall through platforms to your death. This movie beats the previous movie by 2 minutes and 20.9 seconds. Much of it comes from using a "bunny hop" trick.